Retail Sale Sign Window Posters - With over 180 designs and 3 sizes of sale signs to choose from 22"x28", 25"x33", and 38"x 50". Sales Signs allow you to promote all of your sales and specials by grabbing the attention of potential customers! Most store sign posters have matching sale tags and banners. Let your customers know about all of your sales with our wide assortment of sale signs from grand opening, anniversary sale, furniture sale, carpet sale, no tax sale, mattress sale, red tag sale, made in the USA sale, floor sample sale, and many more to choose from. 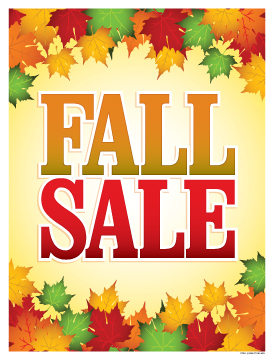 We also carry a large selection of holiday and seasonal sale signs. Retail Merchandising Signs LLC signs are proudly manufactured by us in the USA. Price breaks are at 5 and 10 window posters.